Horrors! I haven’t written since pre-Thanksgiving?? That’s the way my life is going, and I just have to take a minute when I can find it and keep up. You may all think of aging, retiring grandparents as people sitting in rocking chairs on their porches, just waiting to die. The truth is very different. Retirement, at least early retirement, can be one of your most active times of life. We made a choice. We have our grandchildren every day after school. It is delightful, and it is hard work. For me, it means having to carve out time for the things I want to do early in the day. AdventureMan picks up the grandchildren, brings them to our house, makes a healthy snack, supervises their homework and manages their time and experiences. I support AdventureMan, and specialize in hugs, intensely personal discussions, and rough-housing. I can make them laugh uncontrollably. I can cry with them when the world is dark and incomprehensible. I can help them have faith in themselves. I can encourage them to try, try again. So, from time to time we run away and play, AdventureMan and I. One of our favorite things we get in the mail are travel brochures. Most of the time, we don’t care, but the really good thing is that from time to time we get one that ignites our imagination, and we are both all in. Here’s why we are still married after all these years. AdventureMan reads through and his eyes light up and he looks at me and says “You want to do this?” and I say “Yes!” and minutes later he is on the phone and we are committed. And we are dancing for joy. Although we tend to be frugal by nature, history and habit, we are also pragmatic. If the flights are domestic, under four hours, we go economy. When we go overseas, we go business, and we make sure the seats go flat so we can sleep. Our flights go smoothly, and we arrive relatively rested and excited. AdventureMan sends me off to change money while it is convenient, and I come back to discover I’ve kept a growing group waiting for me. Yikes. I apologize profusely and then just keep a low profile. Tauck is a little plusher than our Viking trips; we have a limo that we share with one other couple from Dusseldorf to Koln. The trip is quick, and we arrive at the Hotel Ernst efficiently. Our baggage is already there. People check in, and we discover that everyone has a room except for us and one other group, and as things happen on these trips, the other group and us had a special relationship for the rest of the trip. We were both independent travelers. Our room was unlikely to be ready for a couple hours. I’d like to tell you that I was a good sport, but I was not. I wanted a shower. They offered me to shower in the spa and I was not happy with that. They were really trying to please me, and I was trying, but I was not happy. 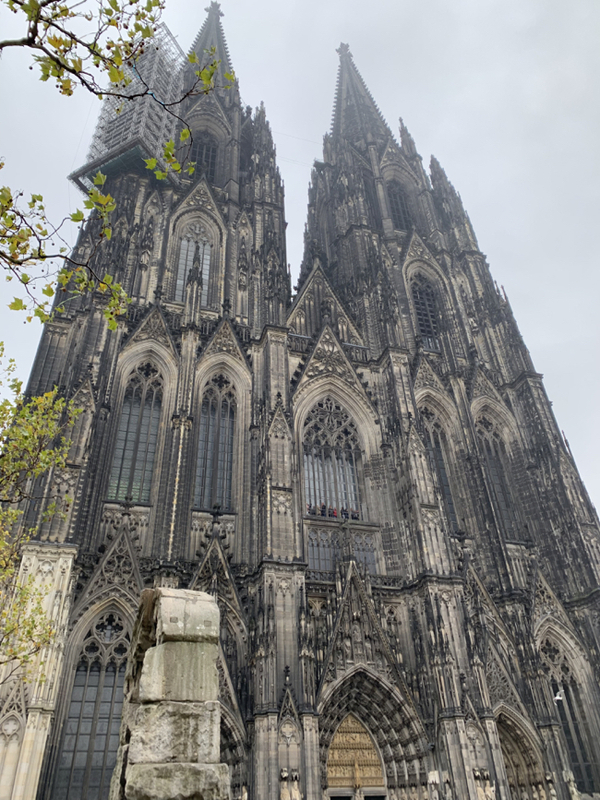 This is the magnificent Cologne Cathedral. 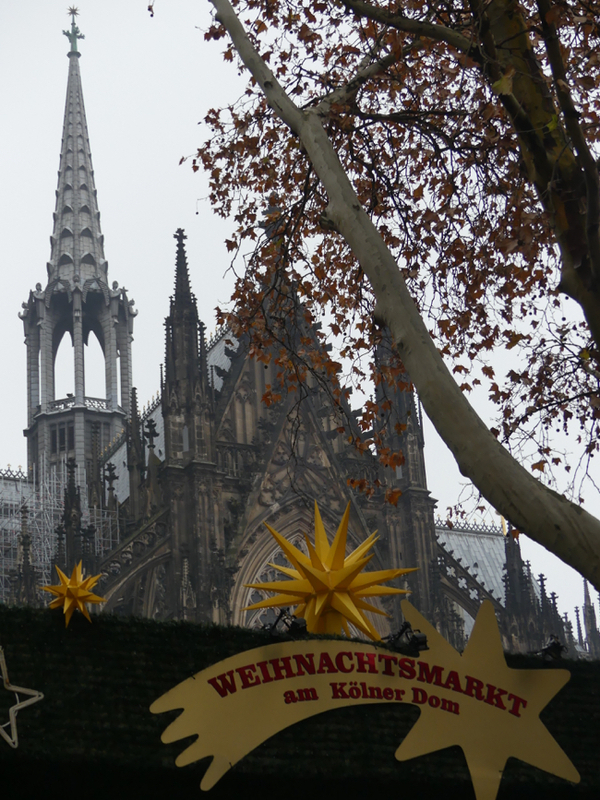 The Hotel Ernst faces the Cathedral. 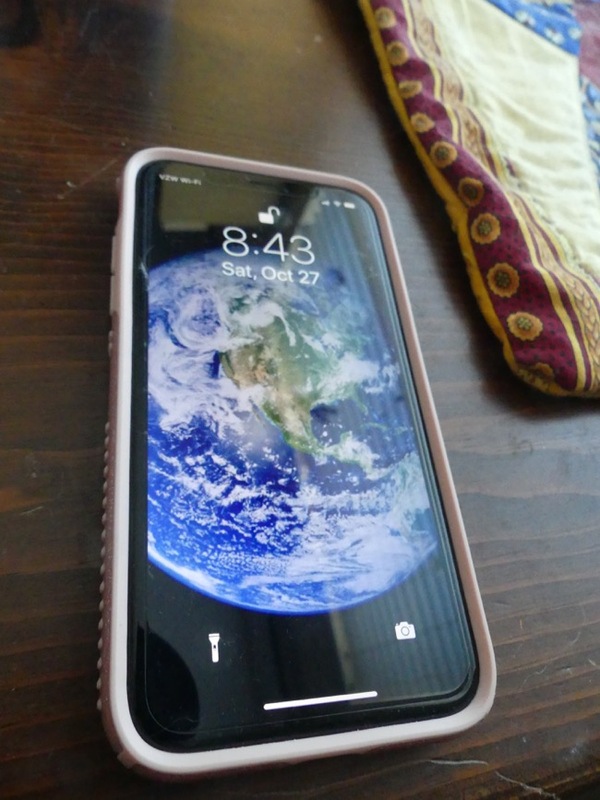 The world looks new and fresh. I take a deep breath and smile again, it smells like home. We find our German comes back as if once again, we lived here and spoke it regularly. 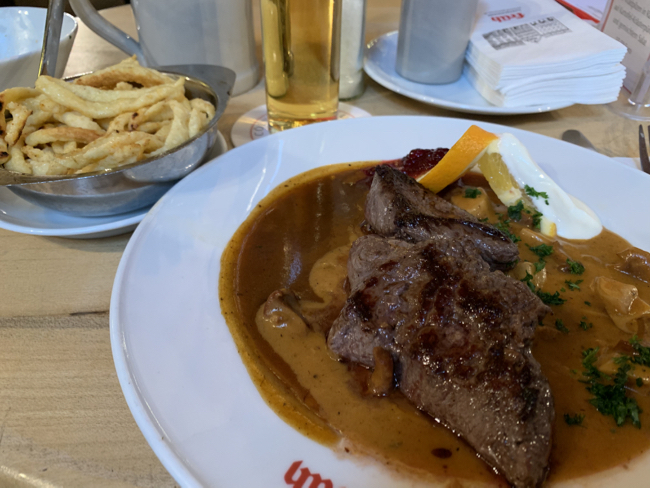 We walk, I take pictures, and when we find the Fruh, we know it is time to have our first meal back in Germany. There is a method to our madness, when we choose a travel destination. This, for us, isn’t about Christmas Markets, although those are beautiful and fun. This is about feeding a need deep in our souls, a need for winter, a need for winter food and walking in the cold air wrapped in our heavy German coats. No, it isn’t rational. Yes, it’s the way it is. Walking into Fruh is like walking back in time. 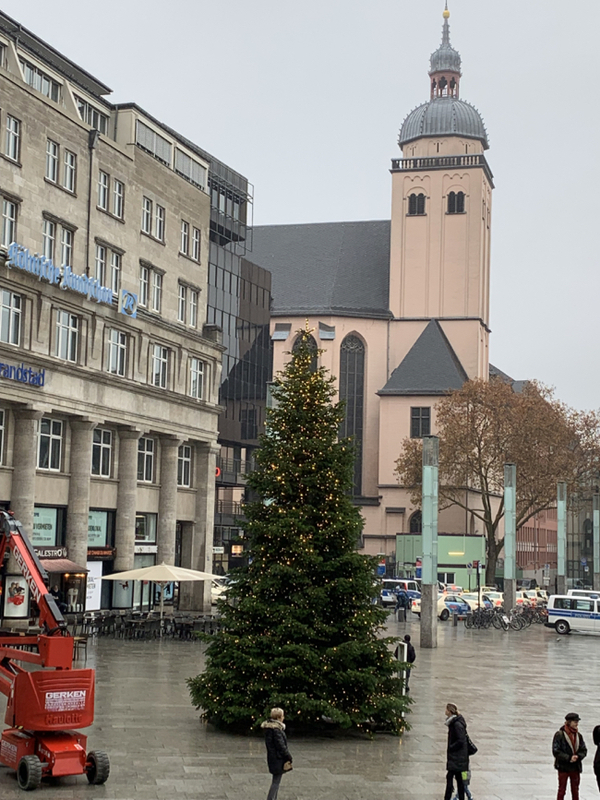 We could be in Heidelberg, or Mannheim, or Wiesbaden, or Kaiserslautern, or any of the German towns where we have been so blessed to live. 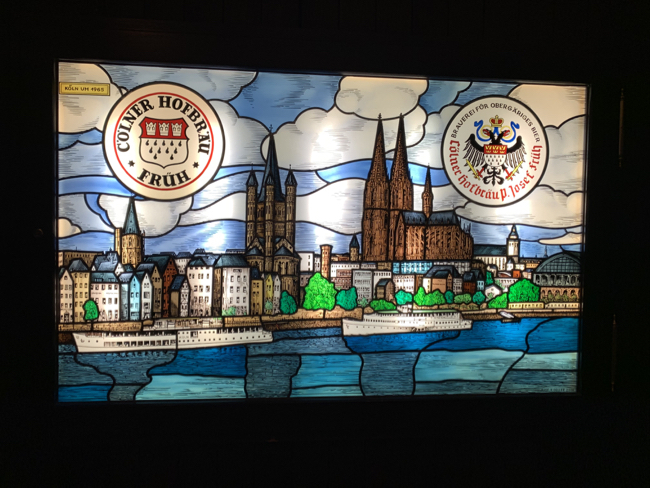 Cologne is very proud to have it’s own beer, and you find it everywhere. It is served in tall thin glasses. 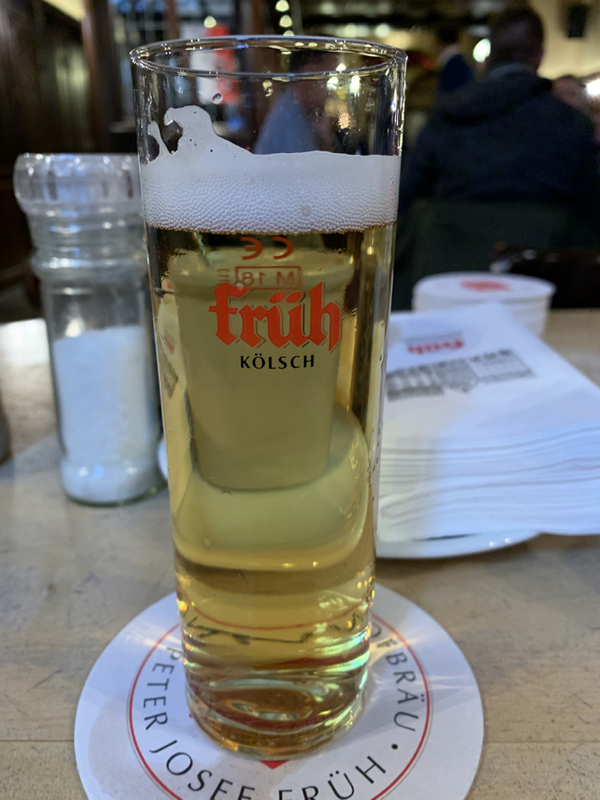 I don’t drink a lot of beer, but I can drink a small glass of Kolsch. AdventureMan says the Bavarians call the glass a “test tube” because of its long, thin shape. 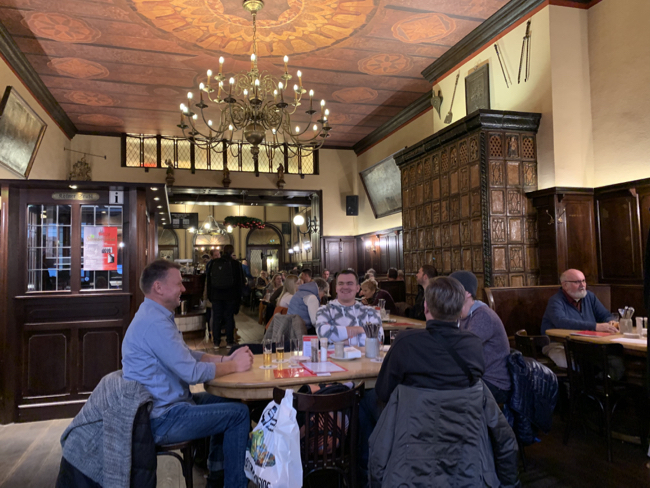 Cologne is not so much a tourist town. The tolerated u with grace; we speak German, but they treated us as outsiders. We know the difference. We didn’t mind so much; we are outsiders now. I wanted you to see the menu, also known as Tageskarte, or daily menu. I also like to look at it and sigh; these are not foods you find in Pensacola. 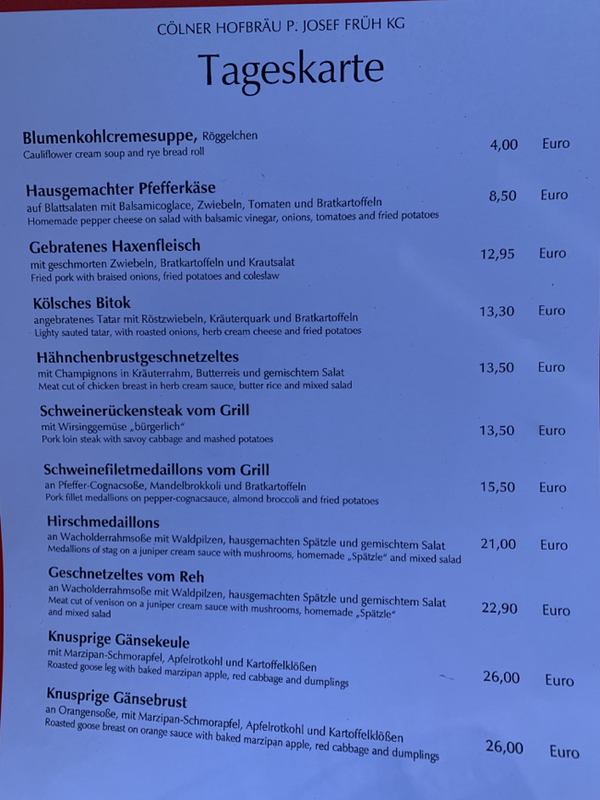 They are not foods you find, for the main part, at restaurants in the United States that call themselves German. Brusque loud voice and all, we are delighted to be at Fruh. They are all the winter foods I was hungering for so nostalgically, deer medallions, goose, heavy winter cauliflower soup . . . ahhhhhhh. . . .
We know we are in the right place. The locals fill in, with their shopping bags, meeting up with friends, we feel at home. 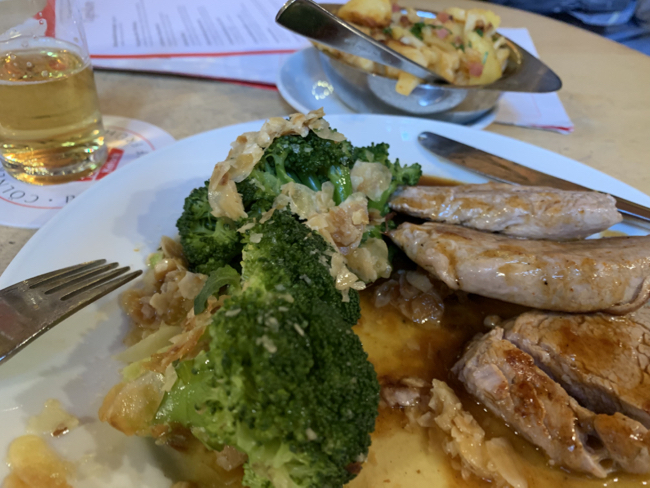 I had Hirschmedallions for my first meal, little deer steaks, with broccoli. This is new to me. I don’t remember food being served with broccoli before. AdventureMan had Schweinesteak, pork steak, and a big bowl of home made potato fries. This is more the heavy, vegetable free cooking I remember. As we ate, the hotel called to say our room was ready. 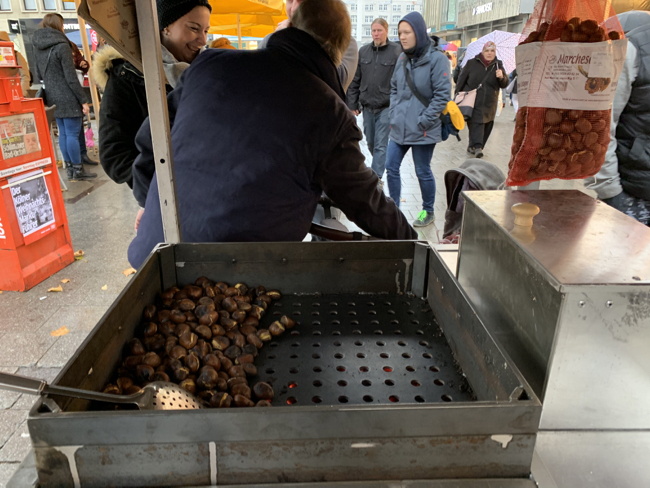 On our way from the Fruh to the Hotel Ernst, the Weinachtsmarkt, the Christmas Market by the Cologne Cathedral, was beginning to open, and I saw my first vendor of roasted chestnuts. We all sing nostalgically about “chestnuts roasting on an open fire” but the truth is, no matter how much my French and German friends rave about roasted chestnuts, I don’t like them. I don’t like their texture. I am sort of intellectually delighted to see my first chestnut vendor, but not really excited to eat any of them.